Editor’s Note: With games on Steam Early Access, we feel a full review would be unfair (the games are obviously not yet finished). However, as the developers are charging money for the game, it is our responsibility to provide a full and honest review of the game. Thus we present alpha and beta reviews of a game: all the usual analysis you expect from us, but without a score at the end. We will return to the review regularly, and once it is out of Early Access we’ll put a score on it. Enjoy. We recently had the chance to play Full Mojo Rampage (available now via Steam Early Access), a new PC roguelike from the small team at Over the Top Games. In the game, you play a Voodoo keeper who serves as an empty husk to be modified and amplified by items found in your travels. There are mouse and keyboard controls available, but this game really shimmers as a controller-based twin-stick shooter. Like other roguelikes, death is permanent and adventure progress is not saved. However, through a deliberate progression system, your character will slowly grow more powerful to start level one, allowing you to progress further into the game each run. Each level is randomly generated around a set of aesthetic and mechanical principles. 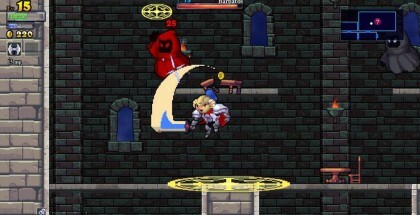 Rogue Legacy is the most prominent recent comparison point, but Full Mojo Rampage has the potential to surpass the variety of combat scenarios and challenges presented in one of Talkingship’s Games of 2013. A top-down perspective allows for variety in layout as well as enemy types. Some of the most deceptively deadly elements include sliding spike walls and pinball bumpers, primed to launch exactly where you don’t want to go. This is clearly a team with a lot of creativity and nostalgia, and it shines through in the gameplay design. As impressive as level generation is in Full Mojo Rampage, it may be surpassed by the stunning art design. Levels are atmospheric without being imposing. Your character and his foes are playful without being overly silly. Shadows and fog cascade across the playing field with a precision and realism that took me by surprise. For a kitchy top-down shooter, this game draws you in with its art and doesn’t relent until you’ve left the game. Up to 4 players can link together and play through a traditional journey, and co-op is simply brilliant in Full Mojo. 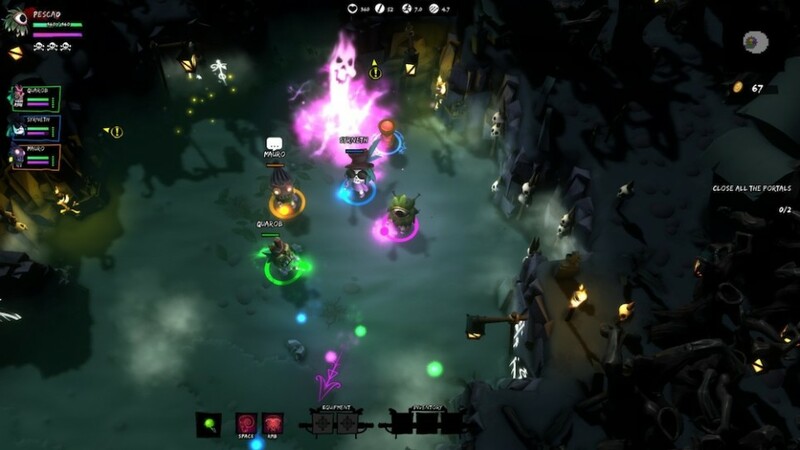 From the panicked realization that you’ve wandered too far from your partner and have no backup for the horde of enemies chasing you to the hilarity of getting taken down by the very same trap that fell your friend while trying to revive them, Full Mojo Rampage’s co-op is ripe for great and unique gameplay moments. That’s not to say the game isn’t currently without flaws. The aforementioned progression system can be flaky. When you die, you don’t always kick back to the levelling screen, which could result in restarting the next round without applying the upgrades you’ve earned. Objectives are usually very simple and somewhat repetitive, too. Outside of boss battles, the goal for a level usually focuses on taking down a few towers positioned throughout the map. These feel more like bugs to be ironed out throughout the alpha and beta process and content to be added before final release than actual issues in the game. Hopefully these small issues can be solved before launch. Unlike many games, the videos on the Steam page actually do this game some justice – seeing it in motion gives you a great idea of what to expect when playing it yourself. If you’re into games like Torchlight, Rogue Legacy and The Binding of Isaac, Full Mojo Rampage is worth a long look. If you’ve got similar friends that are also into voodoo, too, then a) don’t cross these friends and b) this game is going to be right up your respective alleys. Shipheads, keep your eyes open for Full Mojo Rampage. It’s available now via Steam Early Access. Full Mojo Rampage is currently in alpha on Steam Early Access. Preview code kindly provided by Over the Top Games.